Permission is a fundamental element of inbound email marketing. If you’ve lost track of the opt-in status of your contacts or never confirmed opt-in, you can run a permission pass campaign to remove any unconfirmed contacts from future sends. A permission pass campaign is a one-time email campaign that requests any contacts who haven’t already used some form of double opt-in to confirm that they would still like to receive emails from you. Only the contacts who confirm their subscription status are then kept on your list. Those who don’t confirm will then be opted out of your marketing emails in HubSpot. The result is a highly engaged list of contacts who have proven that they want to continue receiving marketing emails from your company. You can see some examples of permission pass campaigns on the Community. This article walks through the steps to implement a permission pass campaign. The steps below are meant to be followed in order, but you can click a particular step to jump straight to it if needed. 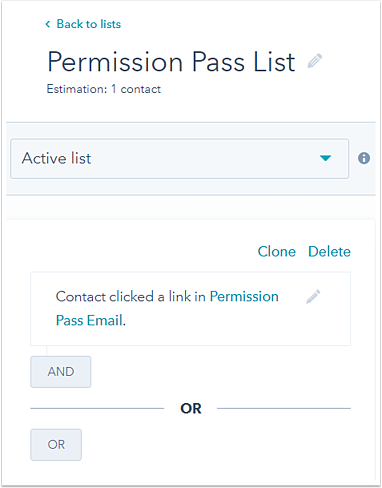 Before you start your permission pass campaign, enable the resubscription emails for forms feature in HubSpot. Enabling this feature will allow contacts who opted out of your emails to resubscribe if they fill out a HubSpot form. Make sure your forms have notification and consent information added to them so contacts know what they're opting in to when submitting a form. Before getting started with the next steps, ensure that you've set up email subscription types as well. Create an active list of contacts who have not engaged with your emails recently. Name your list and make it an active list. If you want to run a permission pass campaign for all your unengaged contacts, follow these instructions to create your list. Create a new email to send to your list. Include a CTA to encourage your recipients to confirm their subscription. Select a template, name your email, then click Create. When editing your email content, include a CTA that users can click to stay opted in. You can link your CTA to a simple thank you page, where you can thank users for confirming their status or even present them with a new offer. When selecting your Recipients, include the list that you created in step 2. Use the Send or schedule tab to send your permission pass email. In the post-send metrics on the Recipients tab, you can see which contacts took action on the email. Contacts who confirmed by clicking on your CTA should continue to receive additional email campaigns from you. Those who didn’t should be opted out of all future email. Use the second list to opt out contacts who did not engage with your permission pass email. It's recommended that you wait a week before continuing to give your recipients time to interact with your permission pass email. Export List 2 as a CSV. Re-import that same CSV file as an opt-out list. Going forward, these contacts will be ineligible for email sends unless they resubscribe. You can also opt to use a workflow with the Manage Subscription Status action to manage their subscription status. While traditional permission pass campaigns send just one email, you can choose to send two or three emails. 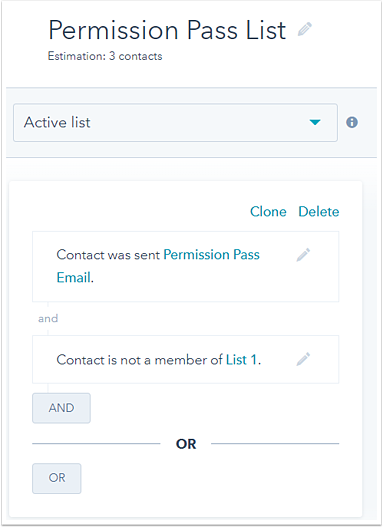 Use list criteria and select your previous permission pass emails to create lists for each subsequent permission pass email. For more details about permission pass campaigns, refer to Spamhaus. As a best practice, it is recommended to enable double opt-in for your forms and conduct re-engagement campaigns on a quarterly basis.